For the price of a double room at one of Bangkok’s upscale hotels, you could rent out an entire three-bedroom villa within 100 metres of the skytrain at an excellent Sathorn location. 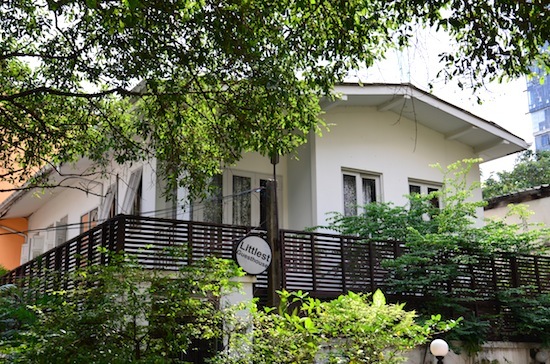 Occupying a beautifully restored house with loads of space, a kitchen, three full bathrooms and numerous outdoor terraces, Littlest Guesthouse is a big score for large groups, families or anyone who likes their breathing room. First, the bad news, depending on your situation: In late 2015, manager Ann told us that, for now, Littlest no longer rents out lone rooms, preferring to rent out the house as a whole. If you’re a solo traveller, couple or small group looking to spend 1,500 to 3,000 baht for B&B-style accommodation in the Sathorn area, you might look into Cafe Ice Residence or Baan Pra Nond. 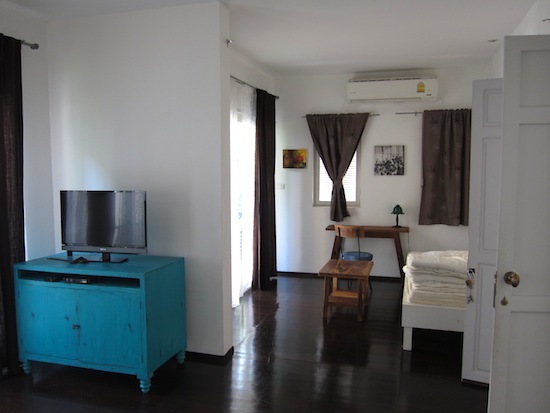 On the other hand, if Littlest’s nightly rate of roughly 6,500 baht is within your budget, renting the house is not a bad idea even if you’re not travelling in a pack. Having the whole place to retreat to would be wonderful in a crowded city where the average hotel-room size is probably under 30 square metres. Whether you want the place to yourself or need to accommodate a group of 10, this is extraordinary value for all you get. In fact, we’ve seen lots of guesthouses that are littler than Littlest (forgive us grammar gods). Shaded by a tamarind tree, the classy two-storey house comes with polished teakwood floors and stairs, several garden terraces and balconies, a reading room, kitchen and large storage closet. Free WiFi seemed to work well. The elegant design employs hardwood furnishings, cast-iron chandelliers, gallery-worthy works of art, glass doors and louvred shutters placed over numerous windows. This bedroom has one queen bed and one single bed. The three bedrooms get you at least 45 square metres each along with an LCD TV, air-con, comfy sofa and chairs, desk, mini-fridge and small safe stowed in one of the spacious cabinets. Any of these rooms could work either as a living room or bedroom and various bed sizes are available. 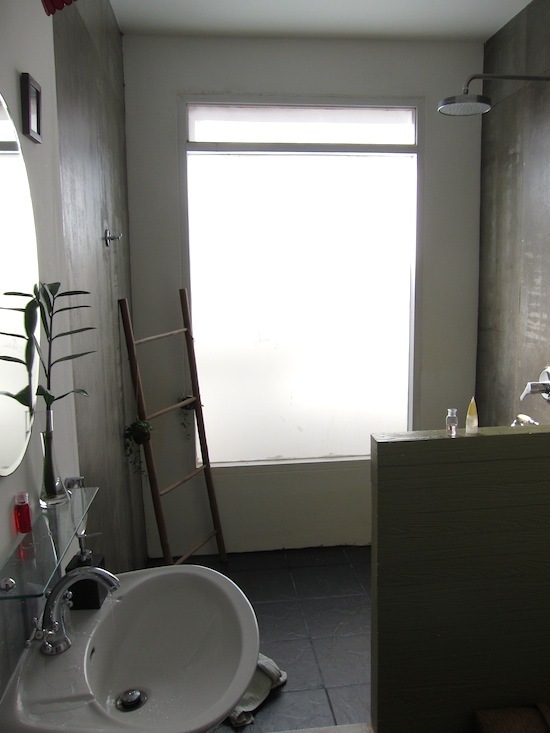 Each also boasts its own very spacious bathroom with slate floor, rainshower, bamboo drying rack and wide white-washed window. Not the littlest bathroom we’ve seen. A staff member comes once a day to tidy up and the helpful manager is always on call, but this is not a typical hotel-type setup with a reception desk. After checking in, you’ll get a feel for what it would be like to live here on your own. In addition to the in-room safes, security comes by way of a tall cement wall and steel-bar door that locks automatically when shut. Glass of wine before bed, mug of coffee in the morning. Situated at the very beginning of a tiny lane that leads into a tangle of old houses, Littlest also scores big points for location. It’s accessed from the back of the King Royal Garden Inn‘s parking lot, and Surasak BTS station is a minute’s stroll away out on Sathorn Road, where a cluster of street food vendors set up day and night. The atmospheric (and delicious) Blue Elephant is next door. The central Chao Phraya express boat pier is one skytrain stop to the east, while the bustling Sala Daeng area and Lumpini Park are just two stops to the west. At time of writing, Littlest Guesthouse’s website is out of commission and the only way that we could find to book online is through Agoda. Ann was however happy to provide info and check availability when we contacted her directly. 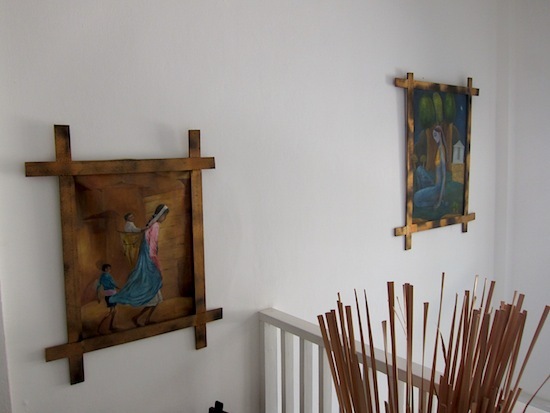 She also rents out a few serviced apartments, available by the night, week or month, on Charoen Krung Soi 65. 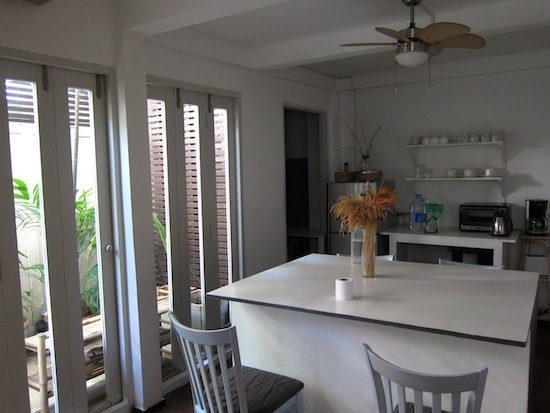 Room: House, low season: 6,500 baht, high season 6,500 baht. Notes: Three bedrooms.